We moved from our Arcadia, Fl., "residence" Thursday, after our week's free stay was up. Our next (and last) stop for this vacation is in North Fort Myers, at another winter "haven" for snowbirds. Like the Arcadia RV park, this one is also very big. A co-op type of "resort," it also has a combination of park trailers and RVs, along with a heated pool, a library, and a multi-purpose building. No billiards, though, which is too bad. I was starting to get the hang of putting those ceramic balls into their holes. The "cool parks" in my headline does not refer to this RV park. (Like the one in Arcadia, it is, to us, just a safe and inexpensive place to stay.) No, the cool parks refer to the parks around Fort Myers. Because our move to this RV park took less than an hour, we had plenty of time yesterday afternoon to explore. Much better than Arcadia, which was really inconvenient to everything. Here we are minutes away from restaurants and "civilization." We had asked the local tourist information center attendant where we could fish. She told us to go across the bridge and we would find fishing piers. The piers, it turns out, are local, on the river which exits to the gulf. And unlike the fishing piers in the Jacksonville area, these piers are free and open to the public. Nice. No one was catching anything, though, so we continued our explorations. We found another park, named after the conquistador Hernando DeSoto. It had two piers, as well as a boat dock. We dipped our lines for a bit (no bites) before visiting a local tourist attraction, Fisherman's Village, a marina offering restaurants and local shops. 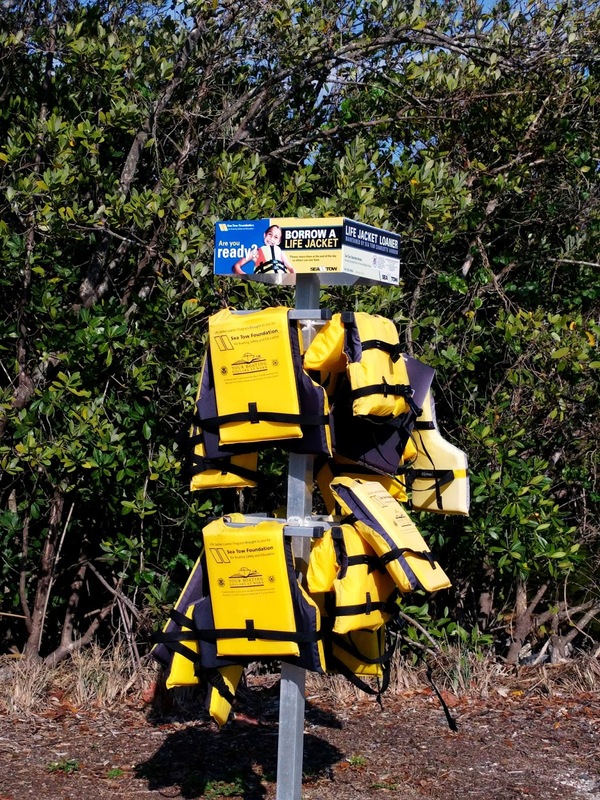 Personal flotation devices are available free to keep kids safe on the water. 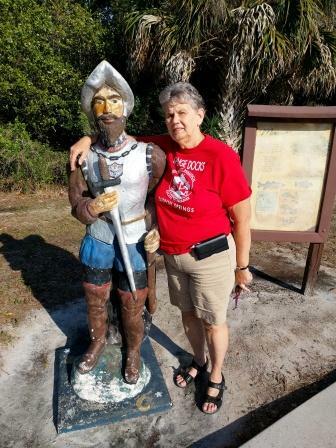 What struck both of us was how Fort Myers has taken advantage of its waterways with offerings for both locals and tourists. 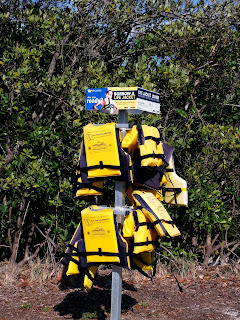 It even had a kiosk of children's life jackets, free for the lending, to encourage safe boating! Why can't Jacksonville make its waterfronts this friendly to its residences? Jim follows a natural gardener on YouTube. This fellow recently visited Echo Farms in North Fort Myer. "ECHO exists to reduce hunger and improve the lives of small-scale farmers worldwide. We provide agricultural and appropriate technology training and resources to development workers in more than 165 countries. ECHO resources include a large knowledge base of specialized information, technical support based on years of experience, and an extensive seed bank focused on highly beneficial, underutilized plants. We work to identify, validate, document and disseminate best practices in sustainable agriculture and appropriate technology. ECHO creates opportunities for community leaders to network with one another to share experiences, ideas and solutions." 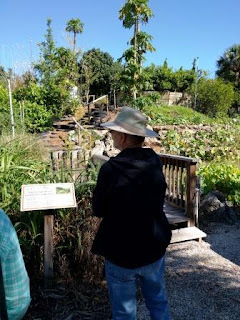 We took two tours: The Echo Global Farm Tour, which showed us how the organization makes the most out of small-scale farming, by growing appropriate edibles and raising the right livestock for the climate of an area (tropical, monsoon, rain forest, etc.). The second tour featured using appropriate technology. Echo teaches farmers how to use resources at hand to make the most of their efforts." Jim wanted to tour Echo because in the videos he had seen he discovered there were a number of plants we can raise that are nutrient heavy. We bought moringa seeds, which will grow into a hedge. The moringa tree is a miracle tree. Virtually every part of it is edible. We intend to find out. We also bought a katuk plant, chaya, and papaya. Katuk can be planted as a hedge. Its leaves have a peanut-like flavor when eaten raw, but are usually cooked like any other green. Chaya is known as tree spinach. It can be harvested continuosly, as long as 50% of the leaves remain on the plant. It should be cooked, however, because its leaves contain cyanide. So, we will be experimenting with new greens. Tomorrow, our last day here, I hope we can catch our dinner,. It's fun to follow your travels, Linda. I have friends in a retirement community called Del Tura in North Fort Meyers. They love the area.